Studying for a church history class, I’ve been doing a lot of reading on the Mercersburg controversy in the German Reformed Church in the mid 1800’s. It strikes me again how much this has in common with the Federal Vision controversy of our own century. Theologically, John Williamson Nevin championed a high view of church and sacrament, very high. He claimed it as Calvin’s view over Zwingli’s, but admitted himself that he went further than Calvin. He taught that the human life of Christ was infused into the the believer through the Sacrament, similarly to what John Calvin taught, but Calvin taught that the power by which this happened was the Holy Spirit using the ordinances of the church as an instrument, while Nevin located the power in the instruments themselves. Nevin taught that the human and divine natures of Christ fused into a third thing, what he called the “theanthropic principle,” whereby the human nature of Christ took on divine attributes. That deified humanity itself then becomes the power that lies within the church, the body of Christ, which he sees not just as an instrument of God’s working but as being truly in an organic union with Christ, so that the life of Christ becomes active in a metaphysical sense in the church. Being baptized inserts a child, entirely regardless of anyone’s faith, into the life of the church, which one must remember is not just a social or communal fact, or an instrument, but is the actual metaphysical or spiritual life of Christ. Salvation then becomes partaking in the life of Christ by being in the visible church and partaking of her sacraments. Many in the German Reformed Church fought him tooth and nail, but he claimed they did not understand him or were insufficiently educated. He continually accused others of misrepresenting what he was saying, even though he himself came to say it more and more clearly and directly as time went on and he became immune to criticism. The German Reformed Church had always viewed its chief forefather as Zwingli and took a more Zwinglian view of the sacraments, that they were real means of grace but by divine influence as a visible preaching of the gospel, not by the transmission of Jesus’ human essence to us in any sense. In Pressing Toward the Mark: Essays commemorating Fifty Years of the Orthodox Presbyterian Church, there is an essay on the history of an OPC church at Leith, ND (p. 369) from its founding until its close in 1983. It was a moving essay overall, but a few things really jumped out at me as particularly interesting, perhaps only to me. First, in 1950 a conflict in the church arose over Sabbath observance, due to the church service conflicting with the town’s softball team’s schedule. This was by necessity (on the church’s side) because the pastor had to preach three different services on Sunday, pushing the final service into the early afternoon. The implications of this controversy ran deep. There was the question of Sabbath observance, of course, but perhaps even more profound was the question of where the church’s primary loyalty was, to the town or to the denomination and its Presbyterian distinctives. With difficulty, the pastor persuaded the church to be true to its doctrinal commitments, but the controversy left deep scars in the church’s relationship with the community, which viewed any challenge on community solidarity from outside elements with great suspicion. This breach was somewhat eased by the next pastor who always organized and performed an Easter and Christmas cantata, which was viewed as a great service to the town. Though I am no Sabbatarian, I often struggle with the degree to which people’s activities take them away from church. I also am very familiar with this small-town dynamic, and the sense that a church which is committed to its doctrinal distinctives and its identity in its regional body will be viewed as an outsider to the community. What surprised me was the degree to which these dynamics were present even sixty years ago in rural America. I thought sporting events scheduled for Sunday were a relatively recent phenomenon, but apparently not. I can’t help but thinking this is a much more pronounced problem today, as our culture becomes more non-Christian, but it may have been an even more difficult problem then, since it was so much more subtle. Everyone was a Christian, they just didn’t want you to be fanatical about it. Being a fanatic is about the only way to be any kind of real Christian today, though. The battle lines are much more clear, I think. Another surprising note was that they had a doctrinal conflict with a nearby RCUS church in Heil, which had a strong Neo-Kohlbrueggian influence, including apparently a denial of the physical resurrection, on the grounds that the sinful flesh had to be utterly destroyed. I did not know this to be a teaching of Kohlbruegge, though I am no student of his, but that flatly denies our own creeds as well, particularly Heidelberg Catechism question 57. 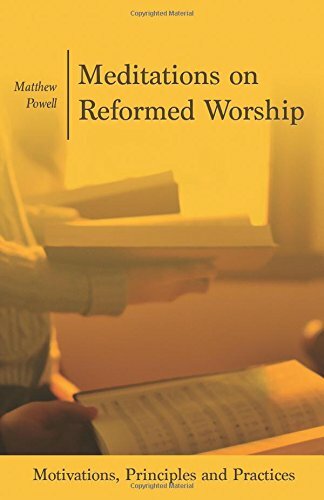 The essay included a note about one pastor finding out that practice in the local church often varied widely from the theory he was taught in seminary, an experience I find to be just as true in the RCUS as in the OPC. Here’s a nice little thing. At the recent RCUS Synod meeting a choir of delegates sang “How Great Thou Art” before the Wednesday evening service. I thought it turned out nice. It was a good meeting. There were disagreements of course, but they were handled graciously and collegially.